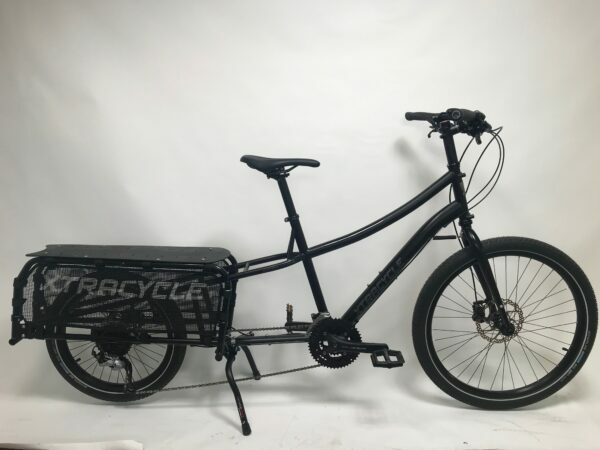 Why ride a cargo bike? This Second Life Certified black Edgerunner Classic comes with a small sized stem and seat post fit kit. The price includes WheelSkirts and a KickBack 3 dual kickstand. This bike is in Very Good condition. It is an early sample of the EdgeRunner classic and has a few minor scratches and signs of light use. The EdgeRunner component specifications can be found here. Please note that this bike has a different brand of hydraulic brakes than those listed on the spec sheet. Need a different size? All EdgeRunner frames are the same size, it’s just the stem and seat post size that differ. If this bike is not the right fit for you, can buy the fit kit you need and simply swap them out. A well-cared-for item that has seen limited use but remains in very good condition. The item is complete and may show some limited signs of wear, i.e. scratches or paint chips. There are no dents. Item works perfectly. For details on the other SLC Condition Descriptions, please refer to the Second Life Certified Condition Guidelines Here. Your name Recipient's email By using this form you agree with the storage and handling of your data by this website. We've sent an email with a link to this bike! Set up an Edgerunner and save it for later. We'll send you an email with the specs and a link back to this exact setup. You'll also be able to view it on your account page if you end up creating an account with us. Your bike has been saved! You'll be receiving an email from us with a link where you can view the bike any time. Get your free ebook, "7 Things I Wish Someone Told Me Before I Bought My First eBike"